The Smart Cities Council, through its leading Readiness Program, works hands-on with cities, counties and states to advance their smart cities initiatives. Below are some of the several dozen that have boosted their efforts through Readiness Workshops. Learn more about their visions and action plans on their pages, and then contact us to set up a Readiness Workshop in your city. While Austin is thriving, success hasn’t been shared equally. The city’s 1928 master plan drove black residents to the eastern part of the city; prosperity rose everywhere else. Austin is one of the most economically-segregated metropolitan areas in the country. 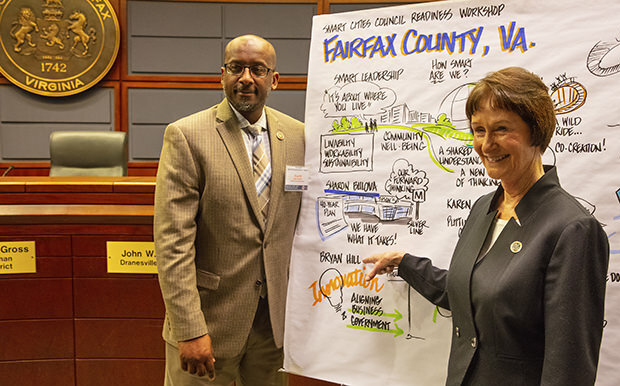 Fairfax County, Virginia, a 2018 Smart Cities Council Readiness Challenge finalist, hosted a Readiness Workshop on March 19, 2018. In FY2018, the county invested $7.17 million in technology projects and used the workshop as part of its efforts to develop a smart cities strategy. Through its Shift Indy initiative, Indianapolis has been looking for ways to make people’s lives easier. Indianapolis also plans to be carbon neutral by 2050 and sees data as a valuable tool that can help it get there. The Louisville Metro has been on the smart path for many years and is now ready to scale its smart city solutions with 115 miles of new fiber optic cable being deployed and multi-sector cross-cutting initiatives. Puerto Rico, winner of a 2018 Smart Cities Council Readiness Challenge Humanitarian Grant, will spend tens of billions of dollars rebuilding its critical infrastructure systems and is determined to make it smart, sustainable and resilient from the start. Through the Readiness Workshop, Virginia will create a framework for its multiple initiatives, including expanding broadband throughout the state; adopting interoperability standards; setting out a cybersecurity and privacy plan; and creating sustainable funding for smart projects.